In every part of the world, Italy is famous for pizza, one of the most produced and loved food. Even if it is a renowned food, only few people know its history. How was pizza born? Virgilio, a famous latin poet, in his epic poem “Eneide” (written between 29 b.C and 19 b.C) described a dough disk used to lay down other ingredients. There isn’t a precise version that could tell us who is the real “pizza father”, but the history talks about two main protagonists: Francesco De Bourcard and the neapolitan pizza maker Raffaele Esposito. De Bourcard was a publisher and Italian academic who wrote a book about Naples and its customs, traditions and rituals. In 1886 he already mentioned the description of the main types of pizza, known today as pizza marinara, pizza margherita and calzone. In detail, pizza marinara is stuffed with virgin olive oil, salt, oregano and little pieces of garlic. Margherita pizza has the same marinara ingredients (except for garlic and oregano) but it is enhanced with succulent and inviting thin slices of mozzarella ordered as petals flower, also known as daisy flowers. One of the best version is the one with Buffalo mozzarella, a true pleasure for eyes and palate. Calzone is a fold pizza which can contain fish, shellfish or ham. This is a particular food popular in some Italian regions such as Apulia, Sicily, Calabria, Basilicata and obviously Campania. The second character of pizza history is Raffaele Esposito. We don’t know if he was the creator of pizza Margherita or if he just gave it the name. In 1889 Esposito was summoned to the Capodimonte royal house, where the Italian king Umberto I and his wife Margherita lived. The queen Margherita chose her favourite pizza and Esposito gave it the name of the queen. She fell in love with a pizza created to honor Italy and its sovereign. As a real patriotic act, tomato sauce, mozzarella and basil remember colours of the Italian flag. What about the word “pizza”? Well, its origin dates back to 997. In some historical documents, it is written that the farm used to pay the rent to the landlord and moreover he cooked 12 pizzas to thank him. So, until the Twentieth Century pizza and pizza restaurants were very popular in the South of Italy and they gradually catched on in other parts of the nation. One thing is certain: pizza is one of the most famous symbols of Italy and an indispensable food! 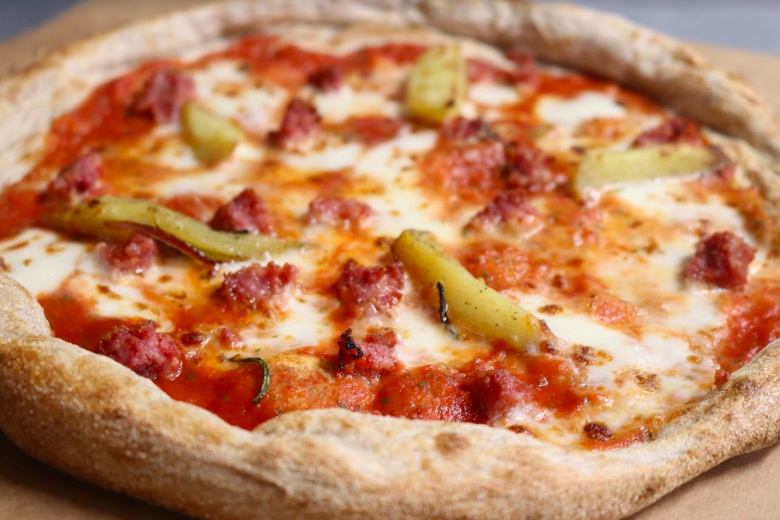 If you are a pizza fan you can’t miss our next event: True Italian Pizza Week from April 4th to 10th! In the 30 participating pizzerias you can taste an authentic Italian pizza (choosing between two), an Aperol Spritz or a Campari Amalfi cocktail and an Amaro Averna (Italian herbal liquor) for just 12€.